(1947, PRC) Johnny Sands, Vivian Austin, Don Castle, Frank Orth. All right, all right…we admit it. We have a weakness for PRC films. This youth-oriented action flick is from the studio’s later period when their films actually started looking like non-bottom-of-the-barrel material. 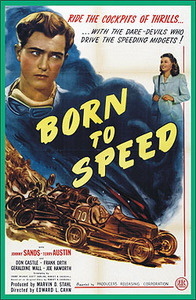 An up-and-coming racecar driver falls for a young babe. The only problem is that her brother was killed during a race and his Dad was killed in another, which to say the least, causes problems. He soon loses his nerve, but then comes back for one final race. Not bad for a PRC JD opus. From 16mm.